Home Equestrian News Ben and Diva take centre stage in Olympia Grand Prix. 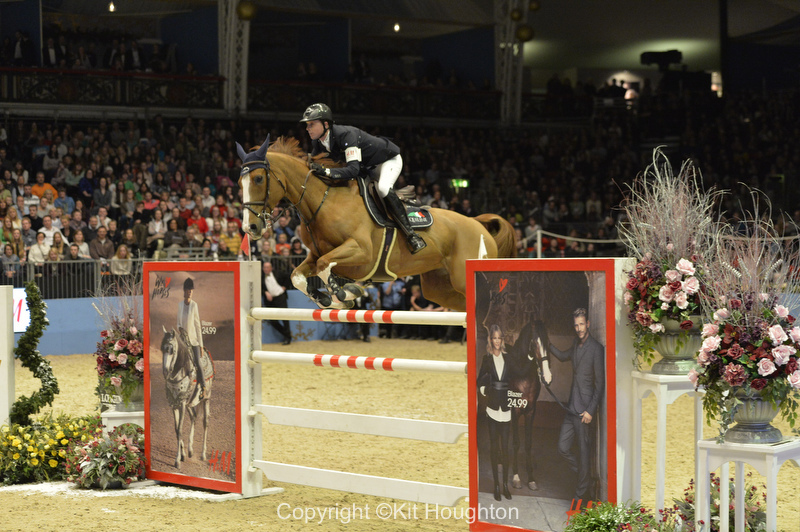 Ben and Diva take centre stage in Olympia Grand Prix. Ben Maher riding Diva II from GBR winner of the Olympia Grand Prix. (Photo © Kit Houghton). For the second year running, Ben Maher saved the best until last to win the Grand Prix at Olympia, the London International Horse Show, on the final night of this buzzing Christmas show. Ben had been placed in eight classes and easily won the H & M Leading Rider of Show award but a win eluded him until the last moment. Riding the fiery chestnut mare Diva ll for Russian owner Tatiana Korsakova, Ben came off best in a five-horse jump-off to collect the spoils. The popular Dutchman Maikel Van der Vleuten, who has had a good show with five places and two wins, finished second on VDL Groep Arera C, ahead of Frenchman Kevin Staut (Ayade de Septon et Hdc). Scott Brash produced the first clear round of the class, on Hello Guv’nor, but it was a big atmosphere for this relatively inexperienced horse and after the nine-year-old ran out at a fence in the jump-off, Scott patted him and took him steadily to finish fourth. Fifth-placed John Whitaker, who has also had a good week with five places and a win, thrilled the crowd with a clear on Argento, but the stallion found himself in too deep to a fence in the jump-off and pulled himself up. Ben’s €21,250 win was a welcome fillip at the end of a mixed year which has seen him drop out of the world number two spot with a series of mishaps with horses, including the withdrawal of Cella just before the World Equestrian Games. “It’s been a tough year but I’ve kept working hard,” said Ben, who was taking off for Miami the next morning to ride the horses he has based in Florida. Previous articleRonan McGuigan and Capall Zidane win $25,000 Nutrena Holiday III Grand Prix. Next articleJur Vrieling wins the Land Rover Masters.